« What’s on Show Tonight? For two decades, Wayne Messmer has been the voice of Wrigley Field, serving as the Cubs’ public address announcer and singing countless renditions of the National Anthem. Ten years ago, Messmer made a courageous comeback after being shot in the throat during an attempted carjacking. 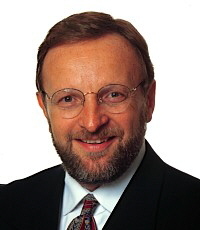 He regained the distinctive singing voice that was a longtime part of Chicago Stadium’s famous “roar” and kicked off games for the Blackhawks, White Sox, Bulls, and Sting, as well as the Wolves hockey franchise Messmer helped launch. We got our pencils and scorecards ready and asked Messmer about his career, his comeback, and the Cubs. The Heckler: What’s your earliest Cubs memory? Wayne Messmer: The first game I ever went to at Wrigley Field was in 1962. It was a Cubs/Dodgers game, and I couldn’t wait to go see Maury Wills try to steal some bases. The Cubs were not everything they should have been back in ’62. I remember taking the El—I grew up on the South Side—and I brought a plywood sign that had to be four feet high, which I think is still in my parents’ garage, that said, “Go Maury Go.” I wonder how the heck I even got it on the El, and then into the ballpark. TH: Growing up on the South Side, did you start out more as a Cubs fan or Sox fan? WM: Actually, my original team—the one that first got me hooked on baseball—was the Milwaukee Braves, back before they moved in ’65. That was because I spent most of my childhood summertime up in Wisconsin, and listening to Braves games on the radio. The Sox of the early 1960s—and actually into the late ’60s—that was a great team. So I went to many more Sox games than Cubs games as a kid. TH: You’d been working in radio for quite some time before making the transition into sports. How did you make that shift and eventually start working with the Cubs? WM: I did 18 years worth of radio, and that’s really what got me the chance to get involved in sports in the first place. My first involvement was with the old Chicago Sting soccer team. So I started doing that, and that exposure led to a call from the Blackhawks, and that exposure led to a call from the White Sox. I did public address announcing and singing for them for three years in 1982-84. That was a great year in ’83, when the Sox hosted the All-Star Game and won the division by 20 games—that was pretty awesome. And then in 1985, I came to the Cubs, so it’s year 20 already. TH: In those two decades of working at Wrigley Field, what was the most memorable game you witnessed? WM: There’s a couple. Last year, the division-clinching Saturday was awesome. Everything had to fall in place perfectly, plus I got to sing the seventh-inning stretch of game two, the clinching game. So that was a great day, and a lot of fun. Before that, I think it was the wild-card game with the Giants in ’98. TH: With the Sox and Cubs playing each other during the season as part of interleague play, how does that feel as someone who has worked for both teams? WM: I’d love it if it weren’t for the extreme fans on both sides. I follow both teams all the time. My childhood team was the White Sox from an exposure standpoint, being a Southsider. I hope the city wouldn’t burn down, but I’d love to see a city series happen. Have it go seven games, and may the best team win. TH: Also, this year will mark a decade since your own personal comeback. Looking back, what has changed in your life and your job as a result of everything you had to go through? WM: It takes an awful lot to ruin my day. I was thinking about that this weekend, about how this last ten years were a decade that could easily have been taken away. At the game, maybe I have even more of an appreciation of the history of the ballpark. And I take nothing for granted. TH: You’ve said the Cubs organization was very supportive during that time and kept your job open for you whenever you came back. What was it like that first time back at Wrigley Field? WM: The first time I came back was Memorial Day of ’94. I came out and threw out a first pitch, and it was almost overwhelming. Of course, the strike happened not long after that. So really, the comeback was when I got to walk out in ’95 on Opening Day to sing. It was breathtaking. Anywhere I sing—but especially there with all the historical significance—I sing it with the enthusiasm like it was my first time, and the passion like it would be my last. TH: When the Blackhawks didn’t renew your contract—citing your role with the Wolves—you wound up doing some singing for the St. Louis Blues. Was there ever a chance of you working for the Cardinals? WM: Never. That can’t happen. We have to draw the line somewhere, even though Tony LaRussa’s a good buddy. TH: Having spent time in both cities and around fans of both teams, what’s your take on the Cubs/Cardinals rivalry? WM: I love it. To me, that’s the way rivalries should be. Of course, there’s always crazy people on both sides of any argument, but I think generally it’s a pure “I love my team as much as you love yours” kind of rivalry. To me, there’s nothing better than a Cubs/Cardinals series, here or there. TH: If we can ask you to play music critic for a moment, who most impressed you and who most hurt your ears among all the seventh-inning stretch singers the Cubs have brought in? WM: I think the bad ones speak for themselves. For the good ones, I still like Vin Scully. Mostly because there’s something regal about him; he goes all the way back to Brooklyn. And the Jack Buck performance showed a lot of guts. He was one of my favorite baseball guys of all time. TH: Other than the “Star Spangled Banner,” what’s your favorite national anthem? WM: The Canadians’ “Oh Canada” is awesome—it’s a beauty, eh? Just from a hockey standpoint, it carries such a great tradition and it’s a great, singable song. And I also like “America the Beautiful” and “God Bless America” from the patriotic jukebox. TH: In addition to your singing and public-address work, you also do a lot of motivational speaking. In that role, what would you say to those Cubs fans who are preoccupied with curses and jinxes? WM: A jinx is brought up when you just aren’t good enough to get the job done, and a jinx goes away when you take care of business. Just like statistics—they’re designed for a second-place team to try to feel good about themselves. But there’s no denying a winner. TH: You called your autobiography “The Voice of Victory.” Did you ever think that moniker would also apply to your role as an announcer for the Cubs? WM: I hope it does. That’d be great to scream “Cubs win” over the P.A. I thought it was going to happen in game seven last year, but you know, wishing won’t make it so—you’ve got to get some hits with men on.